Staff Members Tiffany Allison and Belle Ierardi volunteered on Tuesday, November 6, 2018 with the disAbility Law Center of Virginia in an effort to provide feedback on voter accessibility in Montgomery County. The statewide initiative is to recognize challenges facing voters with disabilities and encourage continued advancements to allow for increased accessibility at the poling stations. Allison and Ierardi visited 16 out of the 21 sites in Montgomery County and evaluated all accessibility areas involved in the voting process. The disAbility Law Center strives to create a more accessible environment at the poling stations to promote electoral participation for all members of the community. 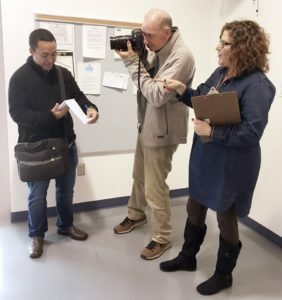 Allison shares her voter accessibility findings with Yann Ranaivo, reporter, and Matt Gentry, photographer, both with the Roanoke Times.